Northern Light is the first of a kind laser uses a 5W blue LED, mixed with red and green laser beams to create mesmerizing plasma type effects best viewed on a flat surface, such as a wall or ceiling. The effect rotates and changes constantly, the speed of which can be controlled manually on the unit to suit the mood. 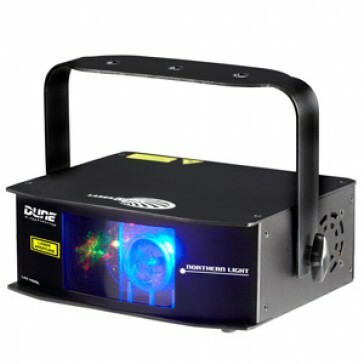 This laser, unlike standard lasers, does not require smoke to create the best effects, making it the most unique and desirable product on the market. 2 motors and diffraction lens for multiple effects. Precision Step motor to orientation. create light wall and light tunnel and cloud sea with the fog.